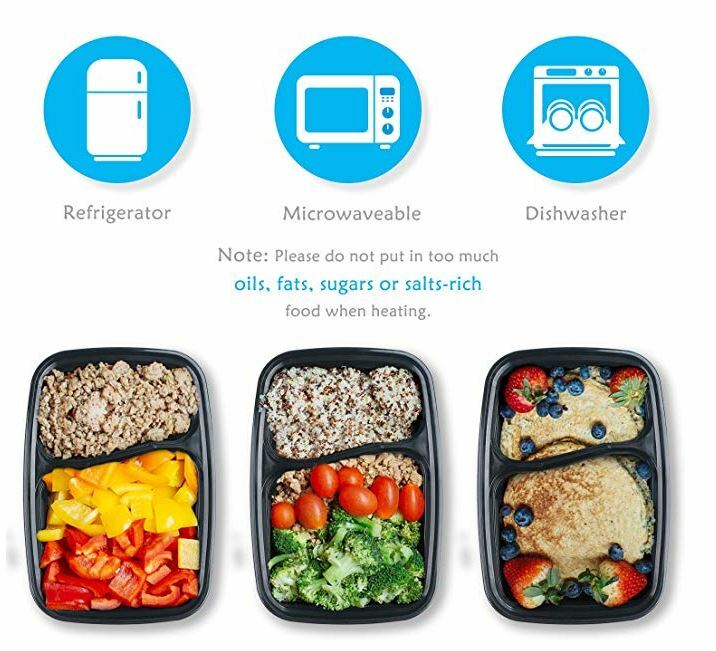 Get this KICHEIF Meal Prep Containers 15 Pack for just $8.99 with the coupon code: B7N43CON at checkout! -Healthy and Safety – The meal planning containers are made from BPA-free materials. -Durable and Reusable – The reusable meal prep containers are very sturdy, they can last for a long time, can be used many times. -Suitable Size – The bento box containers are containers for meal prepping. The size is suitable for food control and take-out. Dimensions: 8.66*6.1*2.36. Volume: 34oz (The larger part is about 24oz,another is 10oz). they are stackable. -Easy for use – The meal prep containers are freezer containers, microwavable containers, also for Household dishwasher. Please note – These containers can't be placed in the oven. Frozen food must be defrosted before reheating. If there were too much oils, fats, sugars or salts in the food, please don't use these bento box containers. These foods can reach temperatures above 100C/212F when heated too quickly. Always leave the lid open when using the microwave. In freezer, the material becomes increasingly flimsy, It probably cause container cracks or breaks.